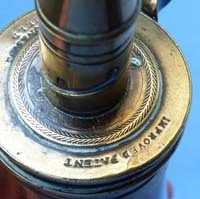 British 19th Century James Dixon Copper Powder Flask. An original hunter’s copper powder flask by the famous British flask maker, James Dixon. 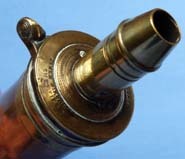 A good example of a copper powder flask manufactured by the famous British maker, James Dixon and Sons. With well detailed representation of a setter hunting dog. 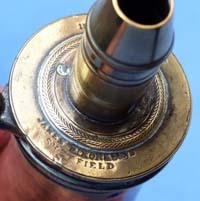 Brass nozzle and measure to top. In good condition - few dings to rear. 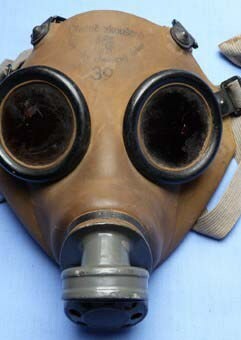 There is a rattle inside - probably some congealed powder? Height is 8.5 inches.